Today's Coupons - Expire in 10 hours. 10 of 11 (91%) reviewers would recommend this product to a friend. The Dogtra 2500 T&B series collar is a compact training and beeper unit designed for the discriminating upland pointing dog hunter. 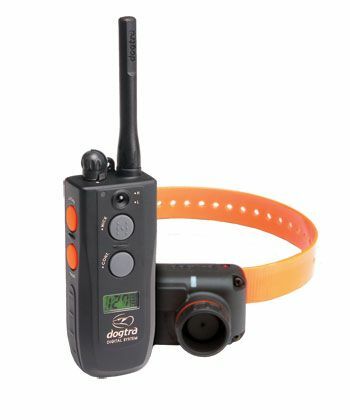 Dogtra 2500 T&B has the beeper horn built directly into the receiver, thus eliminating the bulky horn that sits on top of your dog’s head like other beeper units. The beeper collar has a 400-yard range and a dual high and low three-level volume adjustment selector switch for the run/point mode, point mode and locate only mode. The unit is 100% waterproof with a 1-Mile range, and has 127 levels of momentary and continuous stimulation. The rheostat dial allows for gradual adjustment of stimulation. The transmitter has an LCD window that displays the intensity level, along with a three bar battery life indicator. Includes two-hour quick charge Lithium-Polymer batteries, belt clip and lanyard. Also available in a two-dog system: 2502T&B. Collar Strap: 1 x 24"
Dogtra Company provides the original purchaser a 2 YEAR - LIMITED LIFETIME WARRANTY for the 175NCP, 180NCP, 200 Series, 210 Series, 1400 Series, 1500 Series, 1600 Series, 1700 Series, 1800 Series, 2200 Series, 2500T&B, 3500 Series on parts (excluding batteries) from the date of the original purchase. Labor is covered for two years after purchase. Once the labor warranty has expired, all repairs will incur a variable labor charge depending on the extent of work required. If product registration is not completed within 30 days of purchase and/or the product is resold, the warranty will become void and all repairs will be subject to applicable labor fees. In addition, you can register your product online at www.dogtra.com. Click on the warranty registration link and follow the instructions. Click here - Dogtra 2500 T&B Owner's Manual. Summary:I’ve used other products before and nothing beats the Dogtra 2500T&B. The best thing about it is that it has the beeper feature. This has been really useful for my dog who is quite the wanderer. I can easily spot him even in heavy foliage. So far, it has been a very wonderful experience using the Dogtra 2500T&B. Summary:I’ve had a lot of experience with training dogs and during these years, I have encountered a lot of dog training collar systems. For me, the Dogtra 2500T&B is among the best. It is very rigid and tough. It can withstand very harsh environments. Operating it is very straightforward. Just read through the instructions and you are all set. The instructions are very easy to understand so even first time users will find it easy to use the unit. I’ve just recently bought another unit as a gift to my nephew and I’m looking forward to giving it to him. I’m sure he and his dog will love using this collar. Summary:This product has done wonders to my dog. She is a totally different dog now. She is well behaved and very calm. One time, we were caught up in the rain while using the collar but the collar worked perfectly and I didn’t encounter any problem after it got wet. The results of our training using the Dogtra have been astounding! I will definitely recommend this product to anyone. This is well worth your time and money. Just follow the instructions carefully to achieve the best results. I am one happy customer! Summary:I highly recommend this product. If you want to train your dog well then you should buy this product. It is absolutely worth your money. You will not regret buying this product. It is very easy to use and very robust. I’ve tried using it in both wet and dry settings and so far, we haven’t seen any problems with our unit. My dog and I are having so much fun using this collar. I am very happy that I chose this product. Summary:Since the day I got Murphy, he has been fond of chasing after everything that catches his attention. It was really a nuisance. I just can’t seem to control him especially if he sees a bird. He jumps on his feet and follows the bird wherever it goes until he gets tired of it. I bought this collar online with high hopes that I will be able to train my dog. I wasn’t disappointed. This collar is very effective. It has completely changed my dog. I only had to teach him for a few sessions and he quickly picked up on everything I taught him. Thanks Dogtra!